Here is a bouquet that is veritably bursting with emotion! 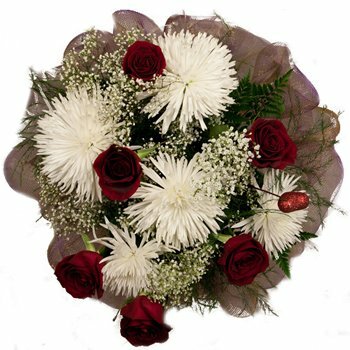 Vibrant spider mums in purest white are dotted with stunning roses in the deepest, most passionate red, dusted with baby s breath, set atop a foundation of lively green and surrounded by a cloud of opaque pink ribbon. Whether it's her wedding, his anniversary, or any romantic occasion, you can not go wrong when you send the Passion's Explosion Bouquet to someone you love.